I’ve read several accounts of magpies “bothering to death” cattle by pecking at bugs on them, causing sores on their hides or worse, — more often, I would guess the birds are after the larvae that grow just under their skin (laid by flies that use cattle as their hosts). Because of this problem, historically, ranchers apparently hated the magpies and would kill them (shooting/poisoning/destroying nests). 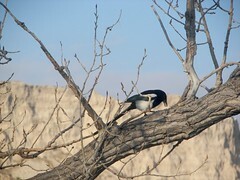 When I saw the magpies grooming the mule-deer, fluttering down from their nest, exploring the deer, and fluttering back up to the nest…. I expected the mule deer to make movements to shake them off, or flinch, or something. No negative responses were observed! 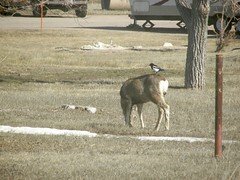 The mule deer seemed pretty happy about this relationship.